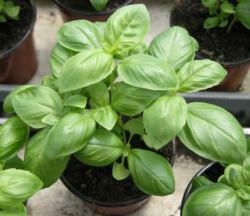 Basil is the gardener's companion for tomato plants. Can't make pizza or pesto without it! And there are soooooo many kinds! Colors and leaf shapes and textures and flavors and fragrances galore! Ocimum basilicum, a member of the mint (Labiatae) family, is an annual herb native to India, Africa, and Asia. It's grown in temperate countries, and its worldwide uses include medicinal, culinary, aromatic, ornamental, and cosmetic uses. Sun: Basil grows best in moderately rich, well-drained, light sandy or silty loam soil in full or partial sun; the more sun and warmth, the more pungent the flavor. Plants grow into a bushy about 18 inches tall, with green or purple or multicolored leaves from one-half to three inches long. Water: It is not tolerant of moisture stress, so the soil must be kept moist throughout the growing season for steady, uniform growth. Leaves are fragile, so some protection from wind is necessary. Plants are extremely sensitive to frost. Harvest: Squarish spikes of small white florets become dark brown seeds that self-sow readily. Leaves are most pungent on the plant when slightly warm after morning dew has dried. Young leaves should be harvested prior to this so that essential oils remain in the leaves. Leaves will be less pungent if grown to maturity or in colder climates. Basil begins to lose its flavor as soon as fresh leaves are torn or chopped, or dried basil is crushed; so add at the last moment before eating. To preserve basil, dry and store in an air- and light-tight container, store in vinegar, or freeze in a bit of water or as pesto. 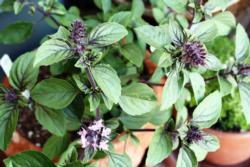 In cooking, basil adds a rich, spicy, mildly peppery flavor with a trace of mint and clove. Uses: It is traditional in Italian, Mediterranean, and Thai cookery and can be used fresh or dried in salads, pizza, soups, stews, stuffings, and sauces; and with tomatoes, cheese, cream, eggs, vegetables, and meat, fish, and poultry. Fresh sprigs make an attractive garnish. A popular sauce for pasta is pesto, made of fresh basil, garlic, olive oil, Parmesan cheese, and pine nuts or walnuts. It is one of the ingredients in Chartreuse liqueur. Varieties include anise, bush, camphor, cinnamon, compact vero, dark opal, green ruffles, holy, lemon, lettuce-leaf, piccolo verde fino, purple ruffles, and thyrsiflora or Thai. Bet you can't grow just one! And if you want to attract pollinators to your yard, try African Blue Basil. It's attractive in the garden as well as to beneficial insects.